**This post contains affiliate links. The shoes seen in this post were given to me courtesy of Eastland Shoes. Thank you for supporting the brands that support my blog! 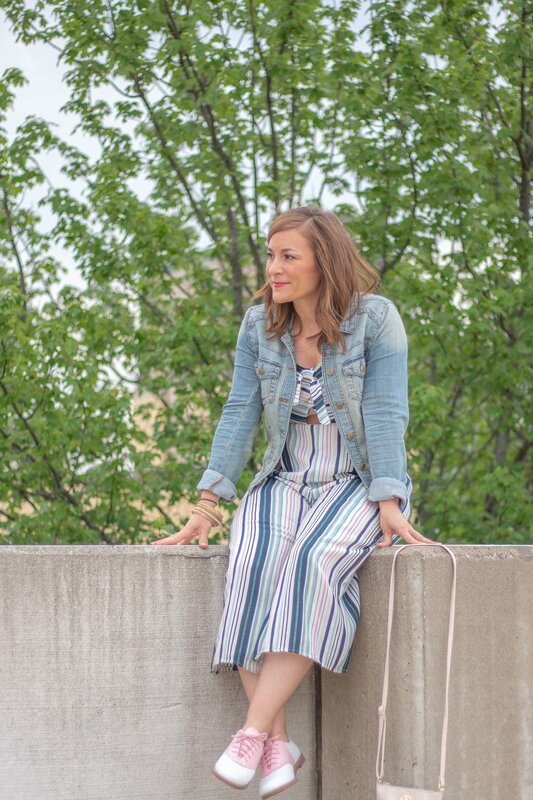 The jumpsuit seen in this post is already sold out:( But don't worry, scroll through to see a few similar options, plus my accessory picks which include, OMG guys, DENIM earrings!!! Ob. Sessed. I feel like I've been a little MIA on the blog when in reality that's only partially true. I actually completed a sponsored post last week that's just waiting for the all-clear from said sponsor (if you like red, white and blue outfits, stay tuned!) annnnd, I've also taken on a little DIY project -re-doing my office. If you've spoken to me in, I don't know that past 100 years, you've probably heard me mention that I'm re-doing my office. Which up until this week, meant it was becoming ridiculously unorganized as I didn't want to put things "away," because I was "re-doing it." But this past week, I couldn't handle it anymore and after my coffee, at about 6 a.m., I decided "today is the day I start." I was feeling inspired, and I knew if I didn't do it right that second, I'd never get to it. SO, slowly but surely, it's official. I'm actually re-doing it. And if you happen to be re-doing anything right now (and even if you're not), I'd seriously consider taking a trip to Hobby Lobby. They're clearance section is absolutely unbelievable as, get ready, they're already breaking out the fall and Christmas. I went in innocently, just "to look." I looked alright. Looked at myself slowly filling an abandoned cart with everything I was just going to "look" at. Hope you all are having an amazing week - what are some of your summer go-to pieces?? ?